Aki-suke died about the year 1155. 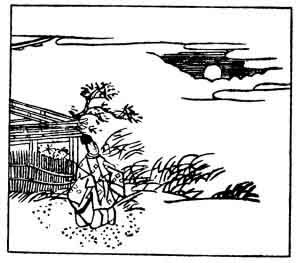 More-izuru literally means, that the light of the moon 'leaks out'; the verse is a charming example of a Japanese picture-poem. Probably the first word of the verse was purposely made to coincide with the poet's first name in sound, although the two words are written with different characters in the original.